Click in the box and type CTRL + C to copy. Then paste into any blog editor to share. Licensed as shareable via Creative Commons Attribution. Link to this page URL for Attribution. It’s always interesting to see how game tastes differ across the globe. Worldwide, action style games are the best sellers, accounting for 1/3 of sales across the globe. Other genres have a more diverse showing, with different preferences among different cultures. Take a look at these three popular genres. Shooter games account for 18% of the Top 75 games in 2013. In Europe, this genre is also represented at 22% of the top sales, but in the United States it accounts for 19% and in Japan only 4%. This looks like Western cultures are a big fan of shoot-em-up style gaming (think Call of Duty). Role-playing games show almost an opposite preference, and we already know that games like World of Warcraft are a big deal. RPG-style games including both individual and MMPORG’s account for 10% of the Top 100 game sales. In the United States, this total is 9% of sales while being a little less popular in Europe at 7%. 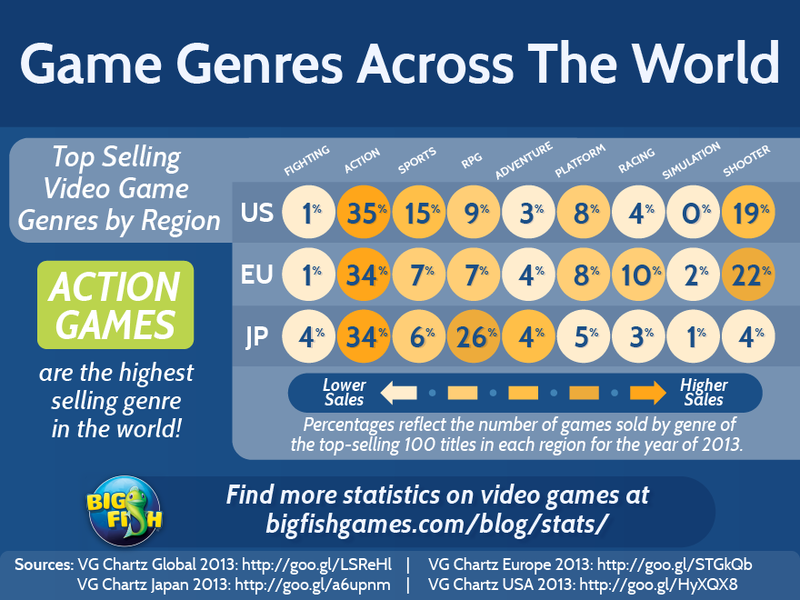 The biggest difference is Japan’s love of RPGs, reflecting 26% of sales for 2013. Looks like we’ve found a favorite! Just to see what else is different, we figured we would check out sports games too. We know that Europe is super excited about FIFA 15, but is anyone else? Sports games rank at 10 games out of the top 100 or 10% of the top selling games of last year. The US has the highest amount of sports games purchased with 15% while Europe follows with 7%, and Japan lists sports as 6% of sales.